hey everyone, time for a field report from right here in los angeles! this one comes to us from monterey park, and is the first post by our new local operative, “M-E”. check it out, and learn all about veggie world, a family owned restaurant. I work in East LA which is an area spotted with little gems of restaurants most of which cook with animal fat- the culinary gems don’t usually leave much for the vegan to uncover. My boss is Vietnamese and while driving she saw a sign for what looked like a new restaurant, “Veggie World” and she was dying to show me the wonders of meatless Vietnamese cuisine. We went today after a rough morning in the office. “Veggie World, Vegetarian Restaurant” is located in Monterey Park and has a vinyl sign with the restaurant name and a little lotus flower hanging out front. We entered zen, the restaurant was empty, but it was immaculate. White walls, beautiful screen dividers, glass lazy susans on the large tables and many jade statues and gold laughing Buddhas evidencing that the patrons were devout Buddhists. The menu is extensive and has $6 lunch specials which come with soup and rice. I rarely get asian cuisine so my boss and I decided to go all out. I must admit I usually shy away from fake meats as I don’t remember or miss the taste of meat but I LOVE asian food so I was game for an adventure. 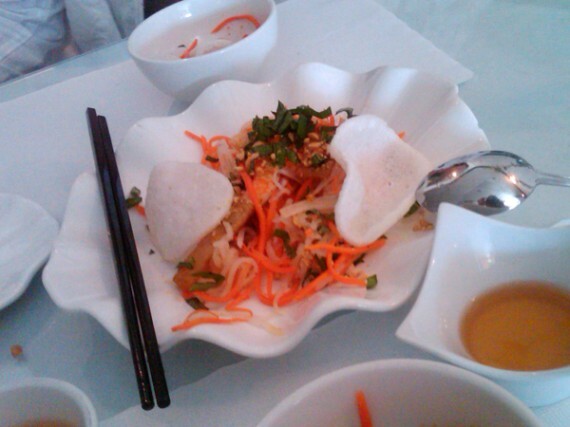 We decided on a shredded lotus salad with carrots, fake shrimp and pork belly and yummy sauce. Really it was sweet, savory, crunchy and delicious and my boss swore up and down the pork belly tasted exactly like the real thing.